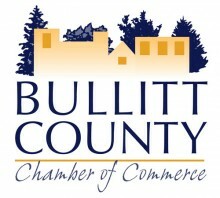 The Bullitt County Chamber of Commerce is located at 162 S. Buckman Street in Shepherdsville. The Chamber of Commerce offers marketing, networking and educational opportunities to Members. This group of business leaders offers Ribbon Cuttings to welcome and develop new Members to be the business voice of the county. The Ambassador Group is consistently involved in recruiting and maintaining membership. The Steering Committee is instrumental in the organization of a monthly Chamber Networking Luncheon that Members are invited to attend. At the Luncheon, there are a variety of speakers that encourage not only entrepreneurial spirit but also philanthropic leadership. There are several Ad hoc Committee responsible for networking and fundraising events such as KidsFest, the Annual Golf Scramble, Chamber Connect, Morning Mingle and the Chamber Annual Dinner. Leadership Bullitt County is an annual program that meets for one day each month over a 7-month period and graduates outstanding business leaders to carry out new goals to improve the community. Leadership is comprised of business professionals who seek to learn more about Bullitt County’s history, government and business, as well as develop networking relationships with other participants. The Bullitt County Chamber is directly involved in creating an evolving strategic plan for the county and is working to integrate and enhance the relationship of the business community with city and county government. 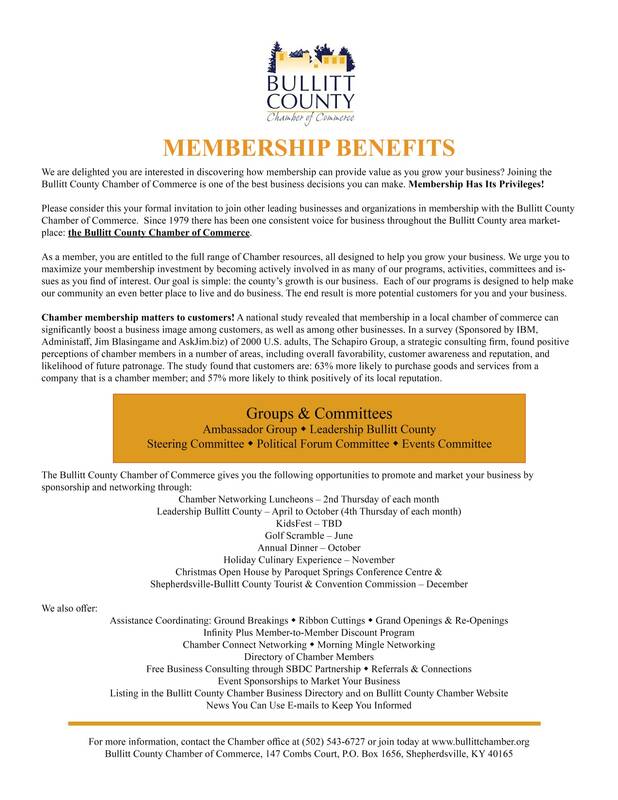 Our Chamber's Membership is continuously growing. All policies governing the activities and operation of the Chamber are established by 17 Board Directors. Each Member shares an equal vote and is encouraged to serve on committees. The Bullitt County Chamber of Commerce's goal is to organize effective networking opportunities that connect our community and tangibly grow business.